On Wednesday 17-February Bogota Beautiful held their monthly board meeting. This meeting , and future meeting will now be held in the Steen School Media Centre. This is located on the Main Floor of Steen School 134 W.Main St. Bogota, NJ. If this space is unavailable the board meeting will be held at the Bogota VFW post #5561 hall. Please visit their website at; Bogota Beautiful for more updates. The new announcements at this meeting were the confirmation of their first Wine & Cheese social. This will take place on Tuesday 15 March starting at 7:00p and be held in the Kennedy Emergency Service Building located at 69 W. Main St. Tickets are $30 per person. Prices include sampling of wines along with assorted cheese and hors d'oeuvres. Proceeds from this event will go to help fund the Bogota Beautiful Community Garden. The first 30 paid reservation will receive a commemorative Bogota Beautiful wine glass. Tickets should be purchased through their website. A selection of wines have been donated by Santa Fe Wines & Liquor of Bogota, music will be provided by DJ Multimedia. 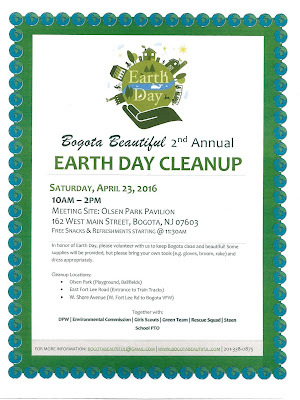 Another event finalized is the 2nd Annual Earth Day Clean-up areas to be worked on this year will be the Little League field on the Eastern Side of Olsen Park. Another will be the Railroad Crossing at Ft. Lee rd. This will be the W. Ft. Lee rd side of the tracks near Antique Row, along with West Shore rd from E.Ft.Lee rd to the VFW Hall. This will take place on Saturday 23- April starting at 10:00 to 2:00p All volunteers are asked to meet at the Olsen Park picnic pavilion before 10:00a. Snacks & refreshments will be provided starting at 11:30a. There will be some supplies proved, it is asked that anyone who wishes can bring their own lawn working supplies. ( Gloves, broom, rakes etc.) . To register to volunteer as an individual, or group please visit their website. Dates have also been set for Bogota Beautiful's Yoga in the Park series. This will take place every Saturday in May & June starting 7-May. This will again be held in Olsen Park , and go from 9:00a to 10:00a. Locations in the park may vary to accommodate the number of participants. Instructors from last year's event Lynn Demetrakis, and Kathryn Livingston will return to lead some of the classes. 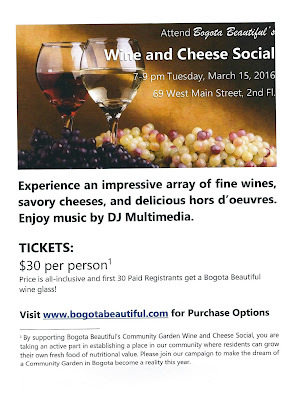 Anyone wishing to participate should register with Bogota Beautiful on their website. Another announcement was the criteria the Bogota Holiday Cookbook. This will consists of recipes submitted by residents of Bogota. Recipes should be appropriate for any major holiday throughout the year. It is limited to one recipe per person. Proceeds for the sale of this book will go to fund the Holiday banner project for later this year. Recipes can be emailed to Bogota Beautiful at; bogotabeautiful@gmail.com deadline for submitting recipes is in three weeks.